I have nothing to say about these nails, except that they look like pizza and I can’t get past it. The orange polish is called Y’All Come Back Ya Hear, and it’s from OPI’s Texas collection from 2011. 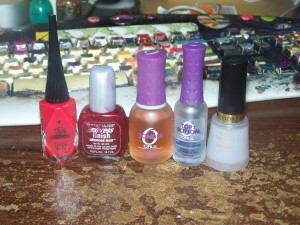 I got it and a few others from the collection for free some time I had a rewards coupon from Ulta. I was pretty unhappy with them because I didn’t expect them to be translucent, which is my own fault for not testing them first. It wasn’t until recently that I learned of the jelly sandwich and gained a new appreciation for these sheer colors. I did my first jelly sandwich with Too Hot Pink to Hold ‘Em from the same collection, and I loved it. 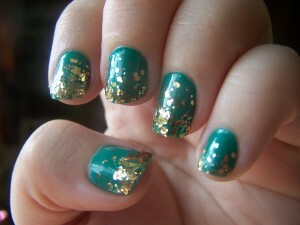 I had the same high hopes for this manicure, but things kind of fell apart when I couldn’t find the right glitter. My test nails started with a coarse holographic glitter that looked okay, but was missing something. I tried almost every glitter I had, and none of them gave me that Eureka! moment I get when I know I’ve found the right one. At least, not until I saw It’s a Trap-eze sitting on the top of my polish box. I picked it up and tried it on my mannequin hand. This was the one. In tests, it looked great. In practice, on my actual nails, it looks like pizza. It looks like vodka sauce. There was more white color in the glitter polish than I thought there would be, which is why the orange looks creamy and tomato-ish. 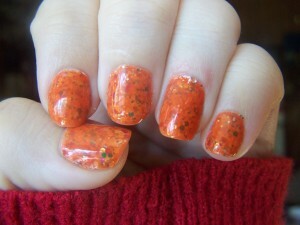 The orange cancels out most of the colors from the glitter, which is why only the greens seem to stand out. I just don’t know about these. I mean, I’ll live with them for the week, they’re not that awful, but I wanted something like the pink ones that got a lot of attention from everybody. This is the first full manicure I’ve done with the Seche Vite top coat. I used it instead of the Top 2 Bottom I usually use because the glitter went on kind of thick and I’d wrecked one during my frog hunting adventure yesterday. I knew the Seche would dry faster and prevent any other accidents, so I used it instead. I never want to use another top coat. So yeah, this week was a nail fail, but it’s okay. It was a good experiment. I love glitter. I love everything about glitter. I feel that no manicure is complete without it. I love flicking my fingers and watching the light bounce from each shining speck. I love finding loose glitter days after I used it, thinking of it not as the herpes of the craft aisle, but as a reminder that there’s no such thing as too much glitter. I am in love with this. I can’t stop staring. Between the glitter and the three coats of top coat it took to smooth it down, they’re really shiny, and it threw light everywhere. Of course, no photo I took could capture both the shine and the detail of the glitter, but this was the one that managed to do some of both. Sorry the photo is off-center, I’m a little ashamed to post it, but I’m having a really hard time with my point-and-shoot camera. It eats batteries like I eat candy and I have maybe thirty seconds to a minute to take a photo before it shuts off and I have to turn it back on and start over. I would use my SLR, but it’s really difficult to take photos at close range, or maybe it’s just better than I am and I don’t know what I’m doing. I could use my phone camera, but it’s harder to take stable pictures with. This way, everything is consistent. Anyway, those are the polishes I worked with this week. 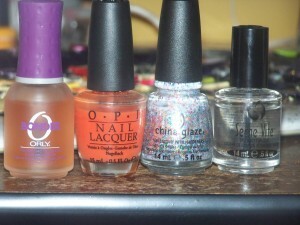 The main color is Rise and Shine from Sinful Colors. I believe it’s the first time I’ve ever used it. You can’t tell from the photos, but it’s got a really subtle blue-green shimmer, and dries with a matte finish. 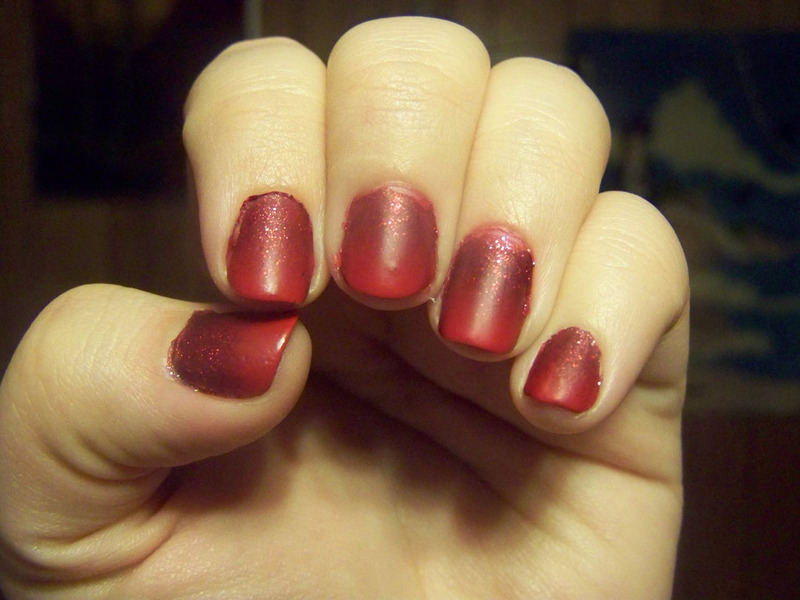 The glitter is Orly’s Too Fab, which I found in a Sally Beauty Supply bargain bin last month or so. The bottle was full when I started. My last attempts at glitter gradients were pretty lousy until now, and I am so surprised this one came out so well.